Survey abandonment is a huge problem most will face when conducting surveys with their audience. There are a multitude of reasons for this. 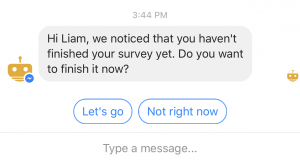 We’re super excited for chat bot surveys and how the conversational experience can keep respondents engaged to complete surveys. From the survey design tab you will now see the “Re-engagement” tab. Here you can add your rules by selecting a time period and entering the message you want to send respondents. 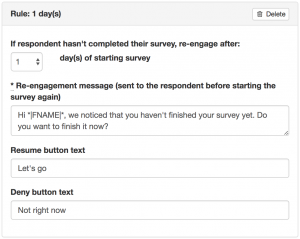 When a re-engagement rule triggers the respondent will be asked to opt-in. You can set the text you want to show in the opt-in options in the survey designer. You can setup multiple rules to run at different periods. This is handy for when someone doesn’t complete their survey after the first re-engagement you can follow up again at a later time.